Free pictorials with images and step by step instructions on how to make each cake. 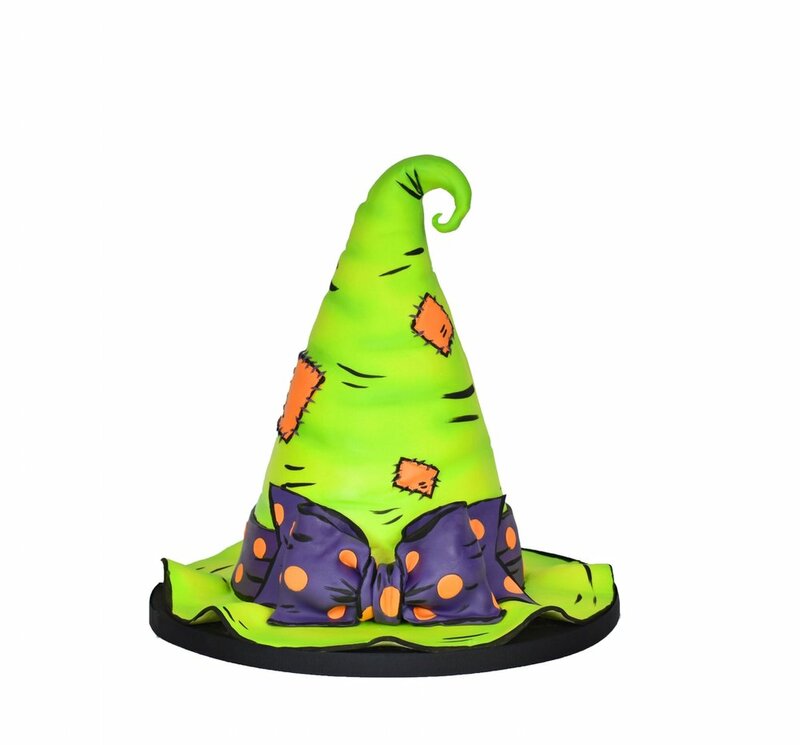 A step by step guide on how to make your own Spooktacular Halloween Witches Hat cake. Torte and stack the 8" and one of the 6" cakes. Dowel these layers. Place a 4" cake card on top of the dowels. Continue to torte and stack the remaining cakes as shown. 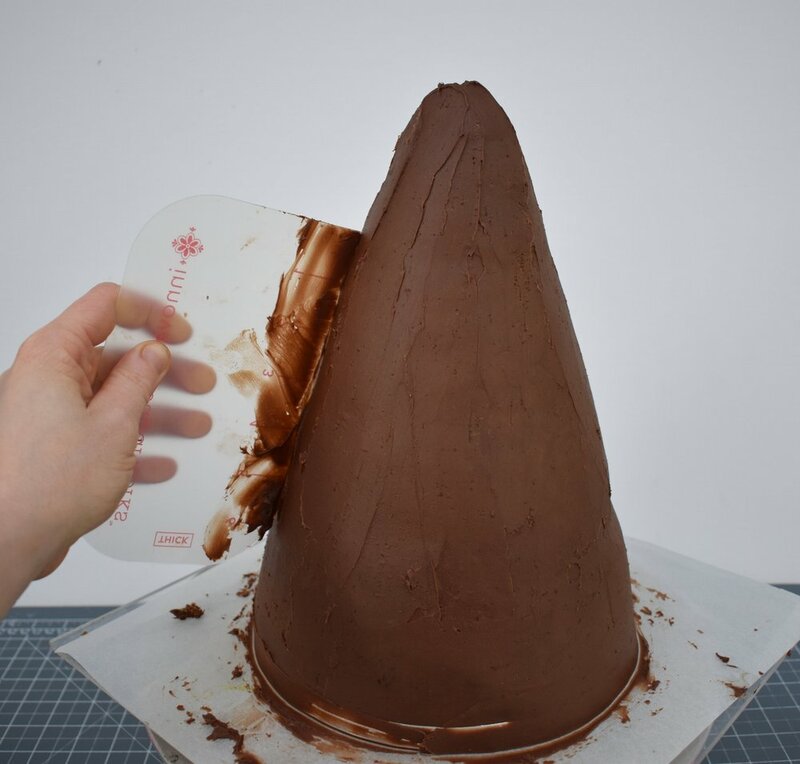 Begin to carve the cakes into the hat shape. The end result should be similar to this image. Refrigerate until the buttercream firms. Cover the 14" cake board with black fondant and leave to dry. Coat the cake with chocolate ganache. Use a flexible smoother to smooth out the ganache and refrigerate until set. Once set attach the cake to the 14" covered cake board using ganache. 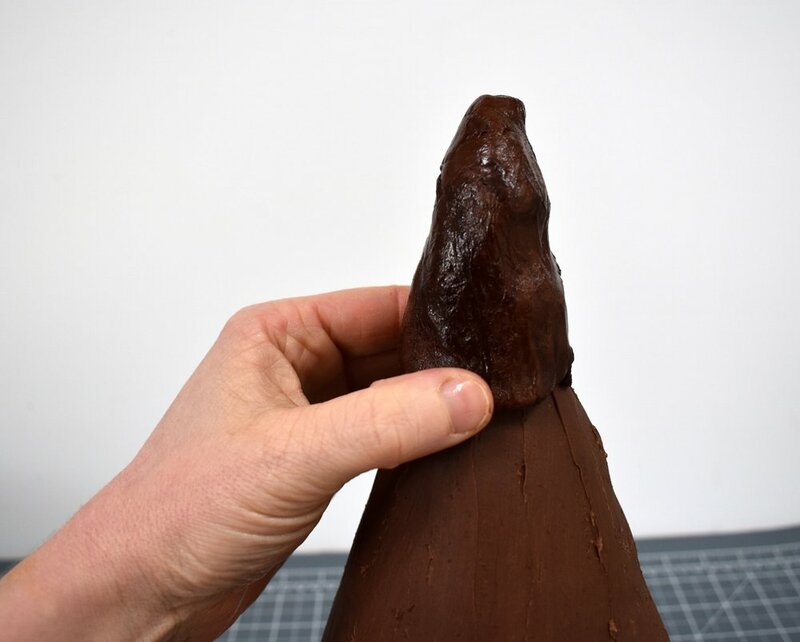 Complete the hat by adding modelling chocolate to the top forming a point. Shape the point of the hat as shown. Roll out 1.5kgs of the green fondant. Cover the cake with the fondant keeping the seam to the side or back. Where the two pieces of fondant meet pinch together gently, and trim away the excess. Smooth out the seam using a flexible smoother. Shape the top of the cake as shown. Use the side of your hand to create some wrinkles into the side of the hat. Use the Dresden tool to create creases in the hat. 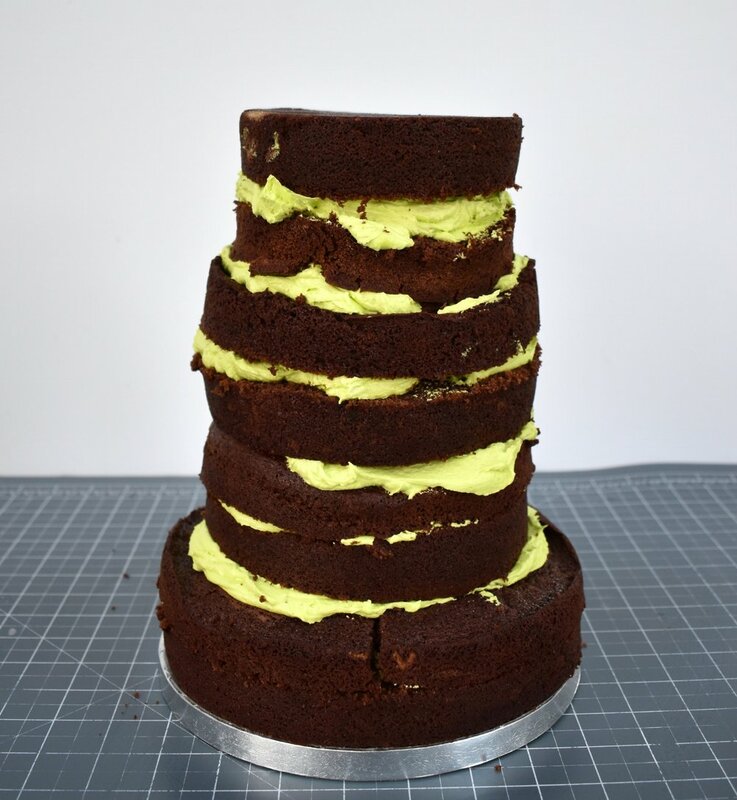 For the brim roll out two long strips from the remaining green fondant and attach to the cake using edible glue. Use some paper towels underneath the fondant to create ruffles in the brim. 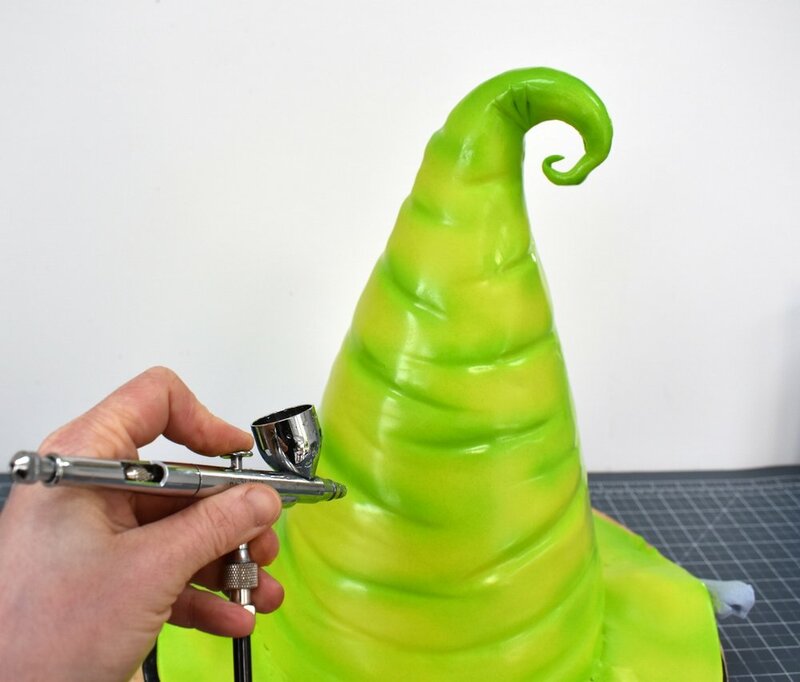 Mix the green and yellow airbrush colours together 50/50 and airbrush the creases of the hat. Leave to dry. 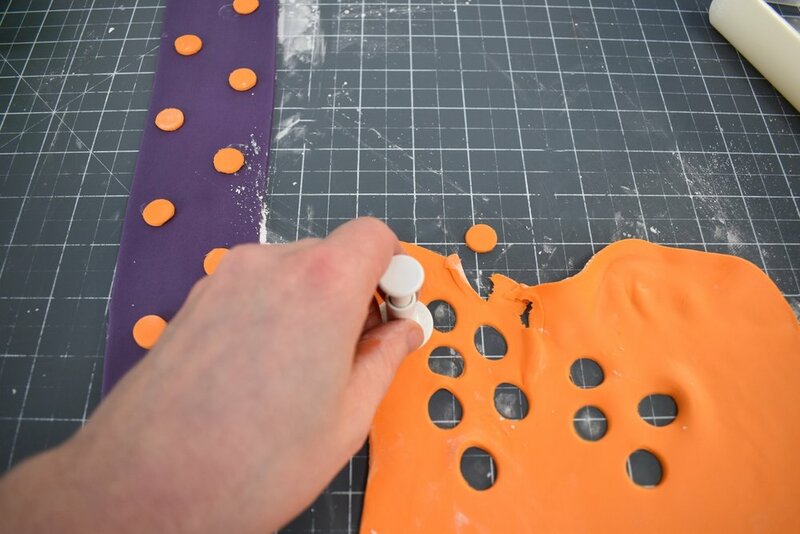 Roll out some purple fondant and use the pantograph cutter to cut the strips that will go around the base of the hat. 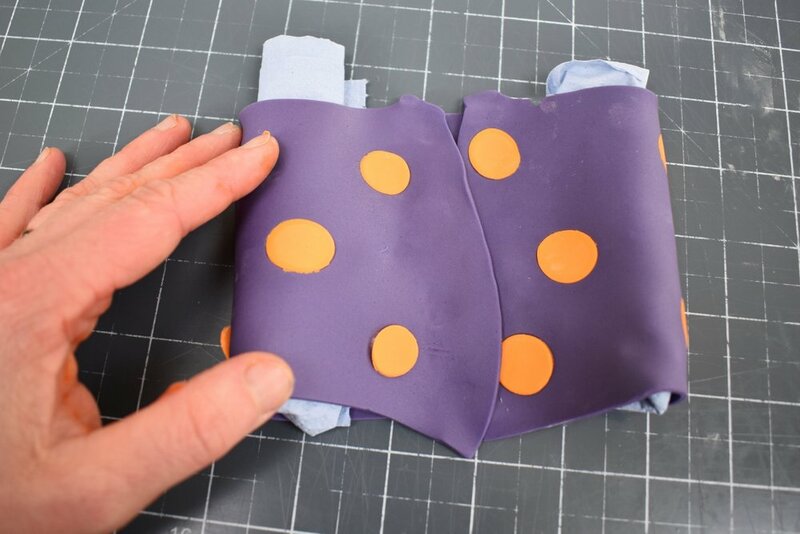 Roll out some orange fondant and cut out circles, place them neatly into the purple strip as shown. Press down using a smoother to secure the dots. Attach the strips to the bottom of the hat using edible glue. 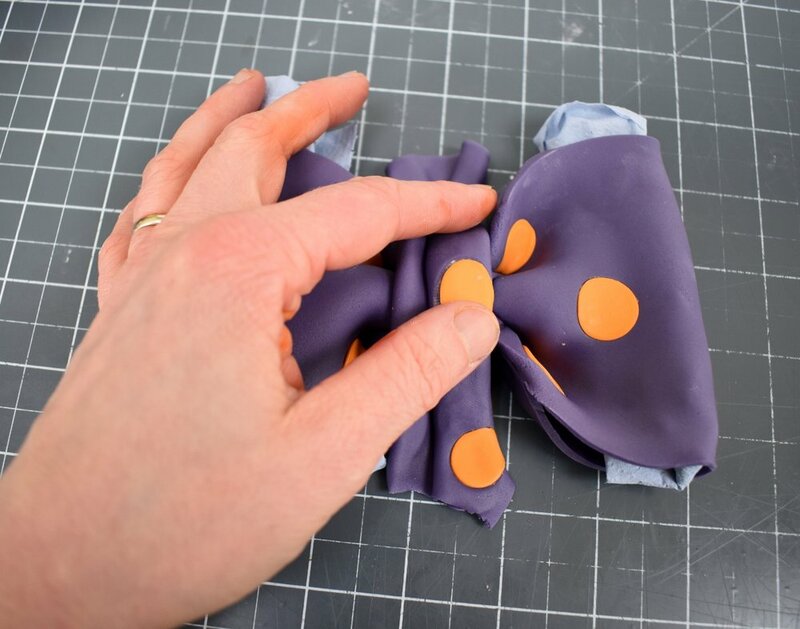 For the bow, roll a wider strip of purple, repeat steps 20 & 21. Flip the strip over and create the basic bow shape as shown. Use another strip to create the centre of the bow. For the tails of the bow create another strip, cutting the ends as shown. 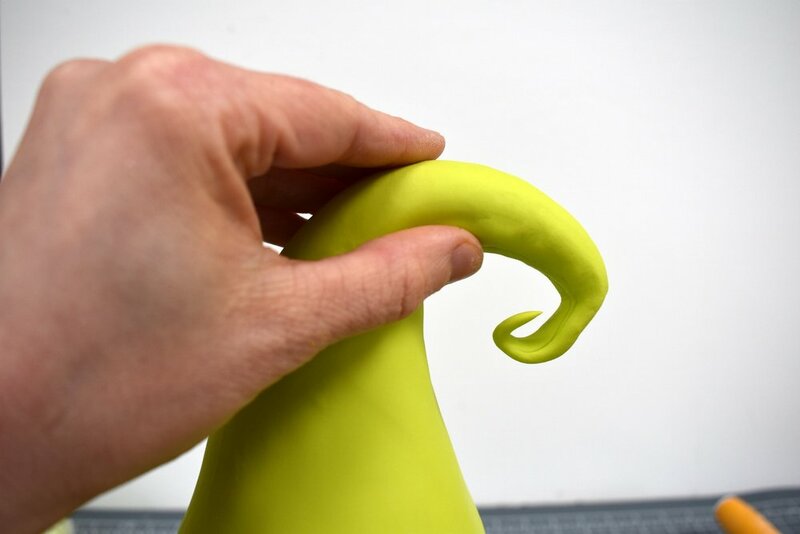 Gather the straight edge to create the tail shape. Attach the tails and bow using edible glue. For the patches cut some squares of orange fondant an attach using edible glue. Use a stitching tool to create stitch marks in the patches. 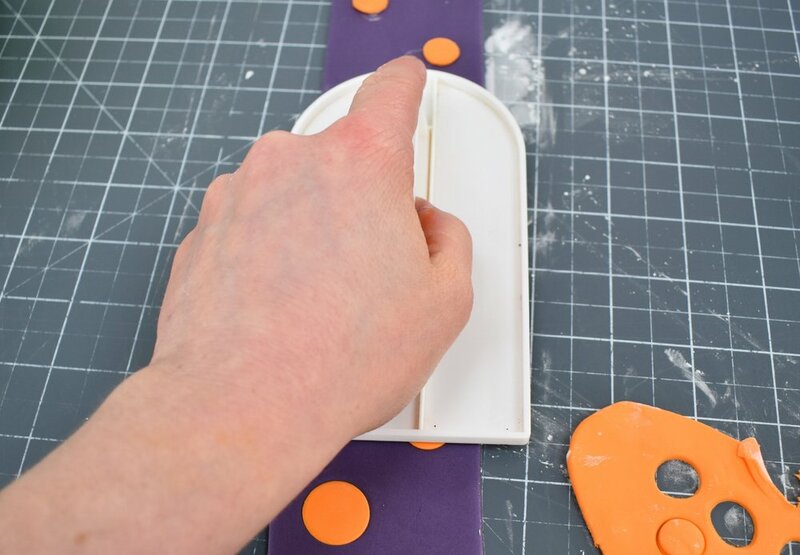 Add a stitch effect to the patch by using purple fondant rolled into narrow lengths as shown in this image. 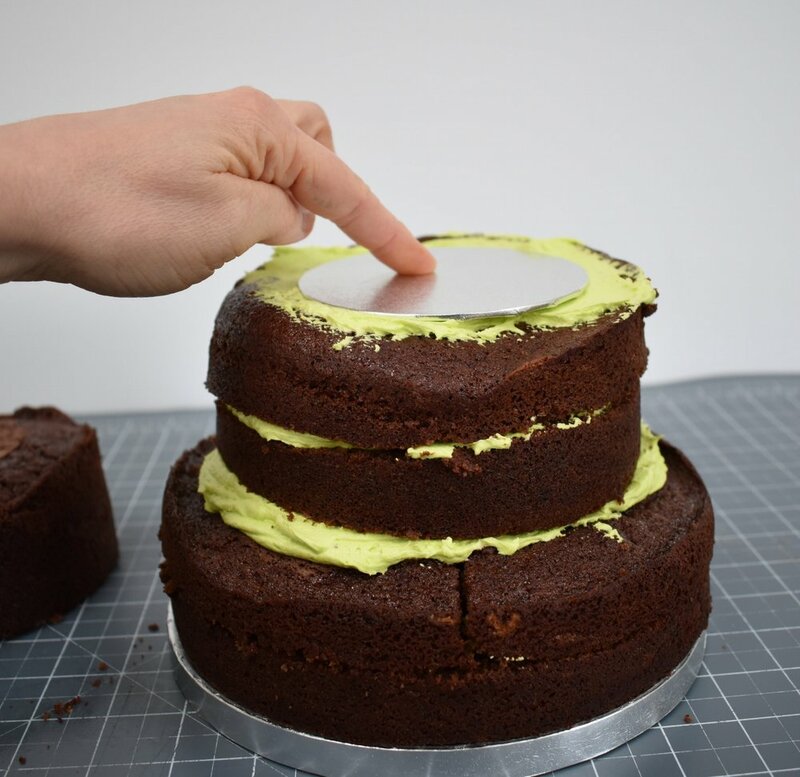 Mix the black petal dust with alcohol to create a thick paint and paint random lines throughout the cake. Line all the edges in black. Once complete add a ribbon to the board. A Step by Step guide on how to make a stylish flowers and chocolate themed wedding cake. Mix each of the petal dusts with a little lemon extract and paint blobs in a random pattern three quarters way up on the burgundy tier, the blobs can be quite wet and allow some to run down the cake. Using a toothbrush and some gold dust flick some paint splatters just above where you have panted. Once the Paint has dried place the cake onto the covered 12" board. Spread the ruby cake lace onto the mat and bake according to the instructions. Once the cake lace is cool spread the pearlised gold mix on top. This should be a solid layer just thick enough so you cannot see the ruby lace underneath. Bake until it is dry. You will need 2 strips for a 6" cake. Remove the cake lace from the mat, cut one end at and angle and attach to the middle tier with edible glue. Do the same on the other side. Roll out some chocolate sugar paste and cut 3 strips, one for the bow, one for the centre piece and one for the tails. Cut the tails at an angle. If your sugar paste is quite soft you may need to add a little CMC to strengthen it. Create loops for the bow. 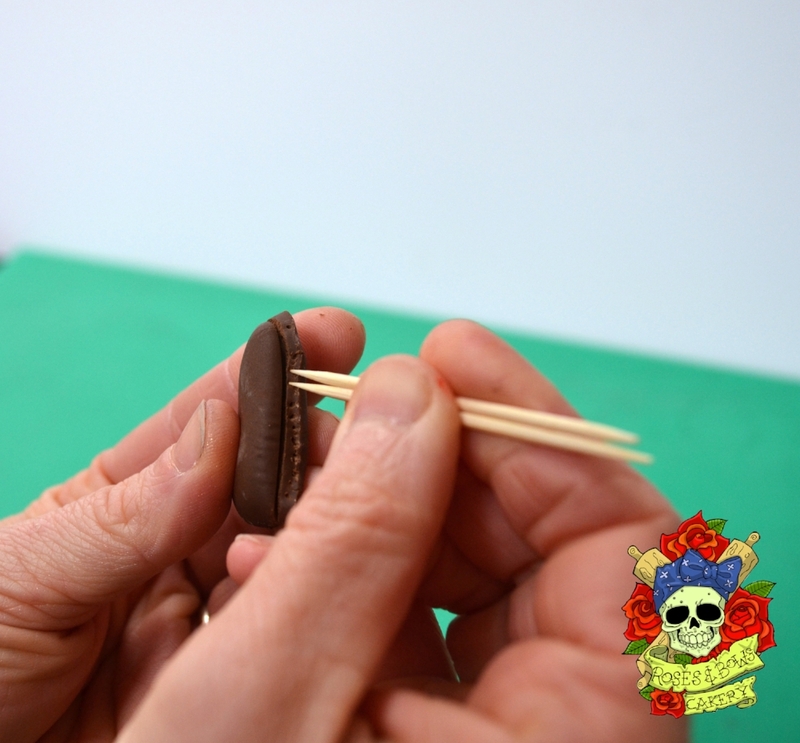 Attach the centre piece to the bow and pinch off any excess at the back. Stack the 6" cake on top of the 8" cake and assemble the bow using edible glue. Highlight the bow with gold lustre dust mixed with lemon extract. Cut some 5 petal flower shapes from wafer paper. You need 3 sizes, large, medium and small. You will need 2 of each size. Slightly dampen each petal with a paintbrush and a little water, careful not to saturate. 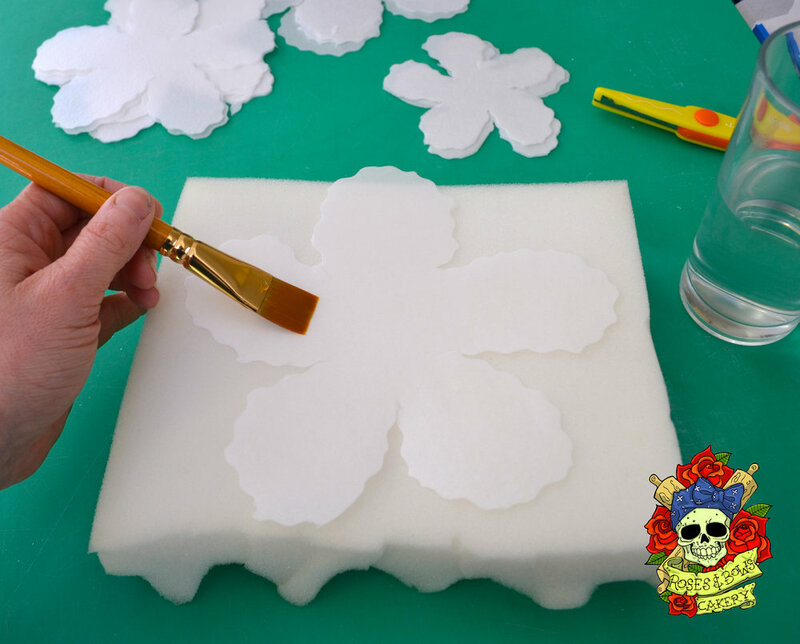 Use a small rolling pin to create some shape to each flower by gently pressing the centres of each petal and leave to dry. Once dried assemble the petals using a tiny amount of water. Airbrush the flower using red airbrush colour with a little brown added, again do not saturate. Leave the flower to dry. Roll out some chocolate sugar paste to approx 8 mm place some clingfilm over the top and cut out 6 circles and 6 hearts. The clingfilm will give a rounded edge to the shapes. Make a line along the edge of each of the hearts and circles with a knife. 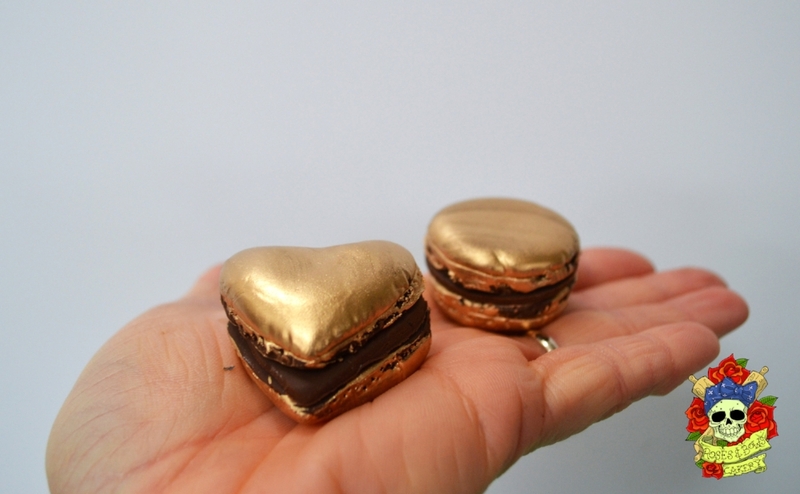 Paint the macarons with gold lustre mixed with lemon extract. 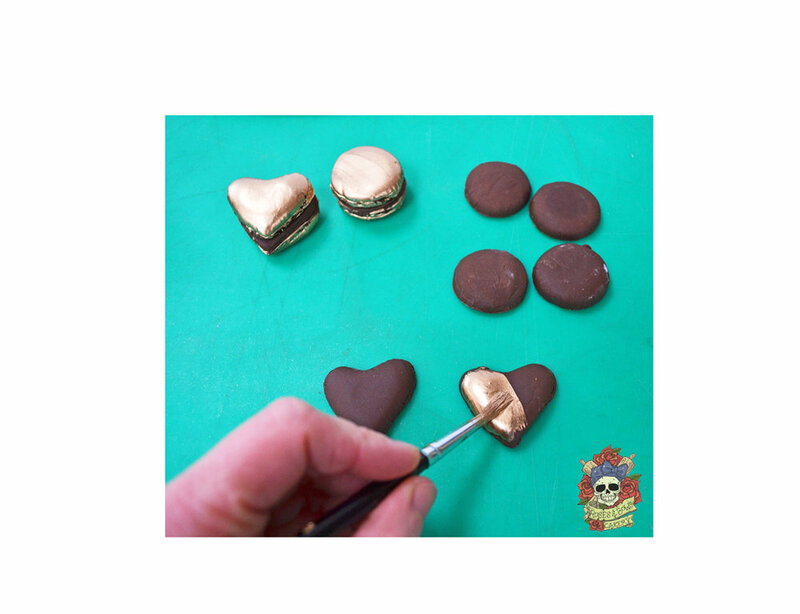 Roll out more chocolate sugarpaste and cut out 3 circles and 3 hearts for the fillings.